Obama told Hughes he would help, "but there are a lot of people like you"
(CNN) -- The homeless Florida woman who made a tearful plea for help from President Obama earlier this year is still jobless and struggling financially. 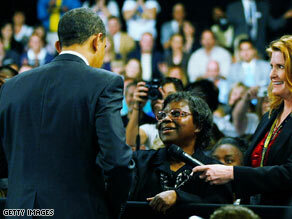 President Obama greets Henrietta Hughes during a town hall meeting in Fort Myers, Florida, on February 10. Henrietta Hughes caught the nation's attention in February when she cried for help during one of Obama's town hall meetings. After her plea, Hughes was given a free home to live in temporarily, but she is still struggling to find a job and might soon lose that home, CNN affiliate WINK reported Thursday. Hughes, who is in her 60s, faithfully goes to an employment center in Fort Myers in hopes of finding a job. "It's almost our second home," Hughes told WINK. She and her son have taken a computer class at the center to help land work. Hughes said she has applied for as many jobs as possible but has struck out. Her son has had no luck either. Now Hughes says she feels time is running out. The home she lives in was donated by the wife of a Florida lawmaker, Chene Thompson, who has been trying to sell the vacant home in the Fort Myers suburb of Lavelle since 2006. Once the house sells, Hughes will have to leave. But Thompson told CNN that she will do everything in her power to make sure Hughes is not back out on the streets even if her house sells. "I've told Miss Hughes ... she will never again be homeless, even if I have to personally assist her with her rent," said Thompson, who is a longtime advocate of the homeless. Thompson said Hughes reminds her of her grandmother and that she and her son are "upstanding, good-hearted people." "Her concern is that she doesn't want to be a freeloader," Thompson said, but Hughes and her son have helped deter vandals who have targeted vacant homes in the area. "They really are a blessing for me," Thompson said. But Hughes told WINK that she worries that she could end up living in her truck again if she has to move without a job. Her plea to Obama came as he promoted his economic stimulus plan at a town hall meeting in southwest Florida. After talking about the plan, the president opened the floor to questions from the crowd. "I have an urgent need -- unemployment and homelessness, a very small vehicle for my family and I to live in," Hughes said at the time. "The housing authority has two years' waiting lists, and we need something more than the vehicle and the parks to go to. We need our own kitchen and our own bathroom. Please help." Hughes said her son had lost his job, leaving them homeless. Obama gave Hughes a kiss on the cheek and a promise: "We're going to do everything we can to help you, but there are a lot of people like you."